We all know how great yoga is for posture, stress relief, flexibility and muscle tone. We envy those supple yogis who seem to be popping up all over social media. But actually getting round to doing a downward dog and finding time for a tree pose is a whole other struggle. A good first step is to turn to Instagram for inspiration. See real-life testimonials from yoga lovers who post such beautiful photos that they will tempt you into giving it a go there and then. These are our top Insta-recommendations. With the stunning white sands and blue sea of Dubai as her backdrop, this yogi has set out to inspire as many people as possible to enjoy yoga as much as she does with her new e-book called Let’s Start Yoga which is full of handy tips, progress pictures and motivation to help you get started. 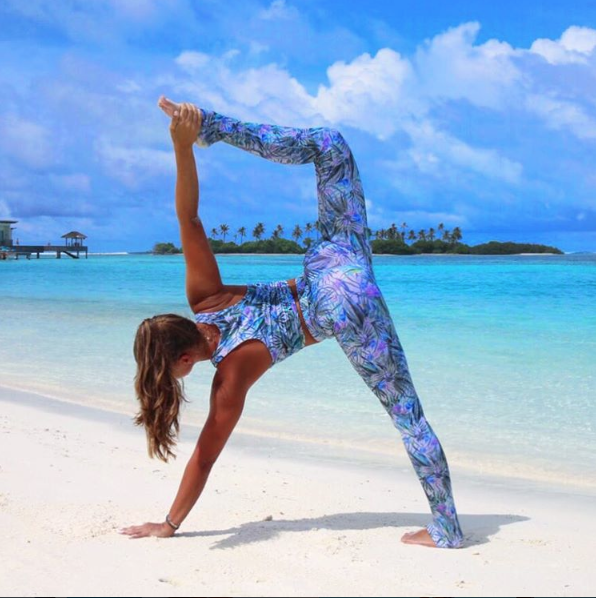 Rachel Brathen AKA Yoga Girl has amassed 1.6 million followers with her passion for yoga, honesty about her own life, and her snapshots of the gorgeous scenery of Aruba. 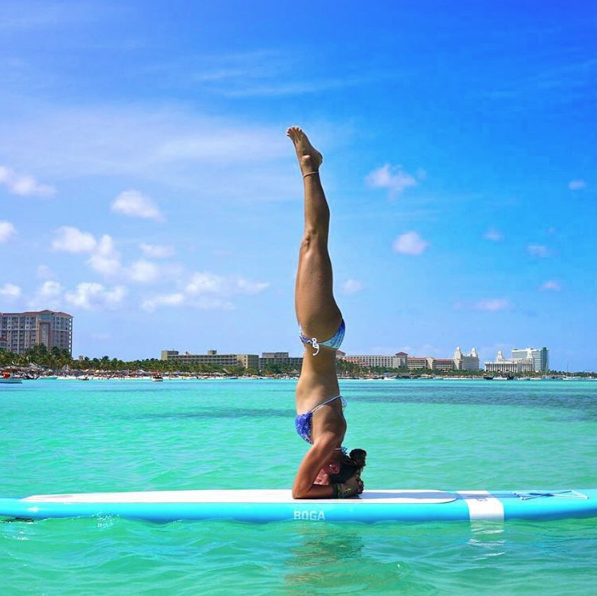 With an impressive ability to practice on surfboards and surrounded by dogs she is a great one to follow for a daily dose of yoga body envy. As a dancer, fitness fanatic and yoga practitioner, Action Jacquelyn is a great role model to emulate. Despite her dedication and determination, she makes it all look so effortless and fun that you’ll want to whip out your yoga mat after 5 minutes of scrolling through her feed. This awesome yogi loves cycling and poetry so her photos have a nice blend of the great outdoors, her unique style of poetry and plenty of impressive poses with a few inspirational quotes thrown in for good measure. 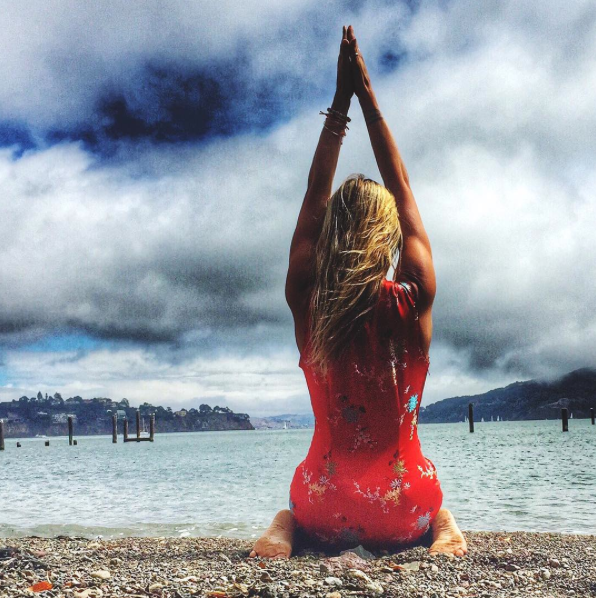 Whether it’s underwater, in the pouring rain, or on a snowy mountain, Caitlin Turner can be found practicing yoga and proving that there are no excuses wherever you are and whatever the weather. This newly converted, self-taught yogi shows us the power of patience and the journey that learning yoga takes you on. The before and after shots from when she started in May up to now proves that it’s well worth the effort and the results are pretty incredible.